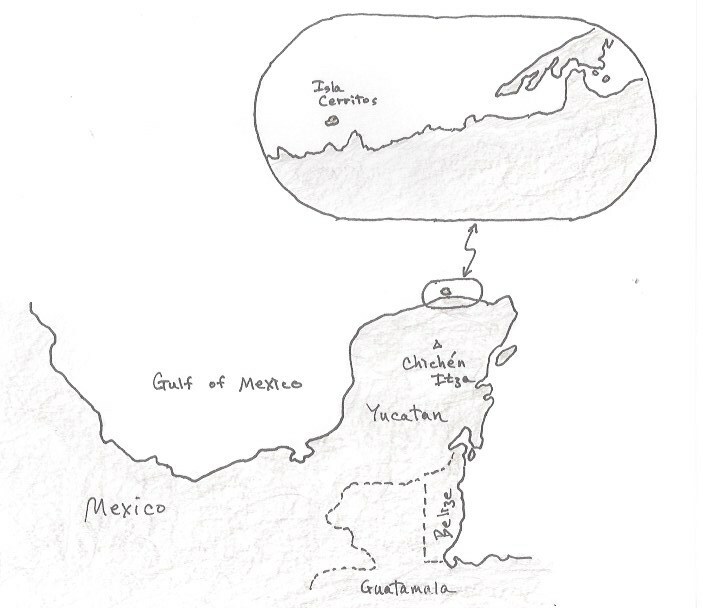 The third book in The Crossover Series, “Collapse,” has a location: the northern part of the Yucatan Peninsula. Time is about 1088 CE. Isla Cerritos is the location of a trading island administered by the rulers of Chichen Itza. It is the initial contact point between the characters of the Crossover series with the Maya people. The Maya Civilization is in decline in this century, but it’s still going strong in the north of the Yucatan. Initial contact between the characters of “Collapse” and the Maya people will occur on what is now known as Isla Cerritos, a small island off the north coast of the Yucatan. Isla Cerritos (a post-conquest name) was a trading center connected to Chichen Itza. Archaeological excavations reveal a largely artificial island with docks, storage buildings, and a pronounced seawall. It should be interesting developing the setting given all the data/archaeological evidence presently available! Not available is the name given to Isla Cerritos by the Maya people back in the 11th century. Any suggestions out there? This entry was posted in Setting for Collapse and tagged Collapse, Crossover, Location, Maya, pre-contact on November 21, 2017 by Walt Socha.